What Would A Grand Rapids Subway System Look Like? Michigan has never been known for it's public transportation, but that may have something to do with the fact that the largest city in the state is also known as "The Motor City". Sure, Detroit has "The People Mover", but it's nothing compared to New York's subway or Washington DC's metro systems. As the population of Grand Rapids continues to grow, so does the need for more infrastructure in and around the city. In the next 50 years our home could be the largest city in the state and with that, we would need to buff up our public transportation. Perhaps by adding a metropolitan subway system? But what would that look like? Well, designer Todd Fenton asked the question "what would a subway system in GR look like? ", and he delivered the answer in spades! 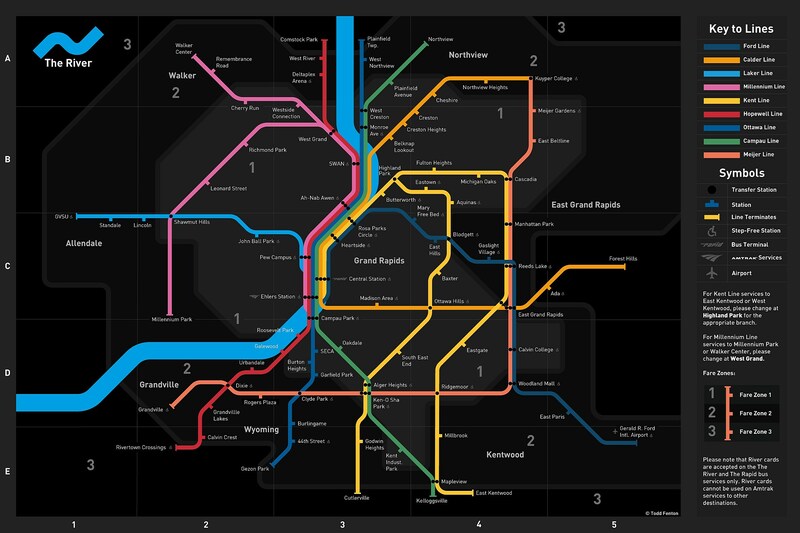 Todd designed an in depth map of a fictional subway system that would encompass the Greater Grand Rapids area. As of right now a subway system in Grand Rapids would be a little bit overkill, but as the population increases over the next several decades, a subway could be a possibility. If you enjoyed this subway system design, be sure to check out Todd's Instagram (@toddfenton), Twitter (@toddmfenton), and Website (toddmfenton.com)! And if you want a print of the Grand Rapid's subway system to hang on your wall at home, you can pick that up on his website! What do you think of the Grand Rapids subway? How often would you ride if it were ever to become a reality? How often would you ride the Grand Rapids Subway?